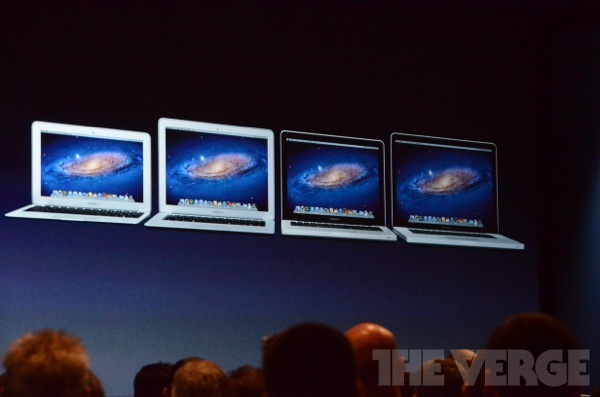 Just moments ago, Apple announced its new line of 2012 MacBook Pro and Macbook Air laptops at WWDC 2012. 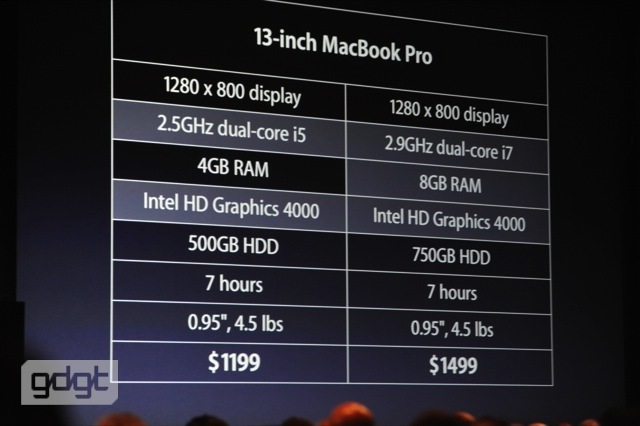 According to Apple, majority of customers care about the speed for their music, video, and design so they’ve upgraded the current Macbook Pro to Intel’s Ivy Bridge processors and Nvidia’s new Kepler-based GeForce GT 650M graphics. With 7 hours of battery life, the new Macbook Pros will be powered by an all new graphics chip which is 60% faster than the older model and supports up to 1Gb of video memory. 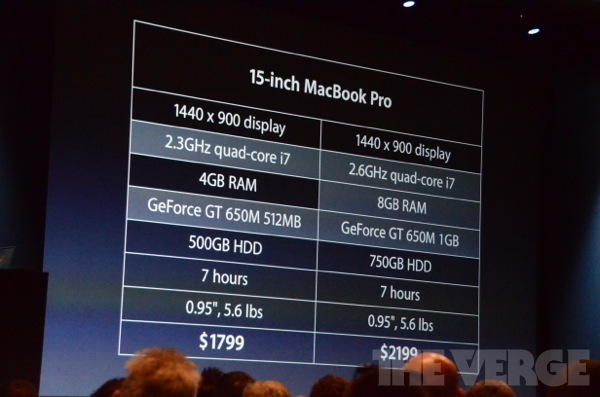 New Macbook Pro also hosts USB 3 ports which are also USB 2 compatible. 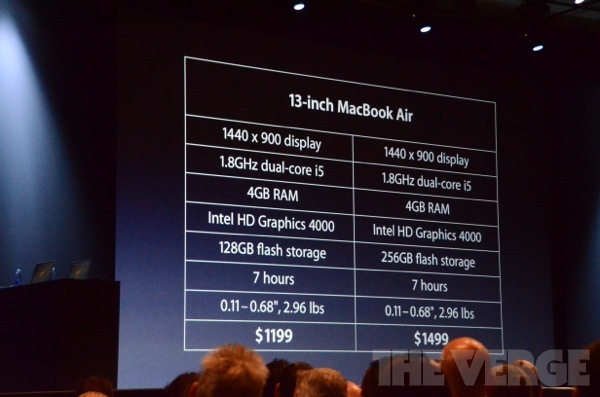 The 13-inch model starts with a 2.5GHz Core i5 while the 15-inch Macbook Pro will ship with quad-core CPU and are available for shipping today. Apple has also announced updates to the Macbook Air lineup, which will now pack up to 2 GHz dual core Ivy Bridge processors as well as Intel turbo boosting up to 3.2Ghz, up to 8GB of ram and 512GB of Flash storage. A port on each side supports both USB 2 and USB 3 while the FaceTime camera has been updated to support HD 720p. 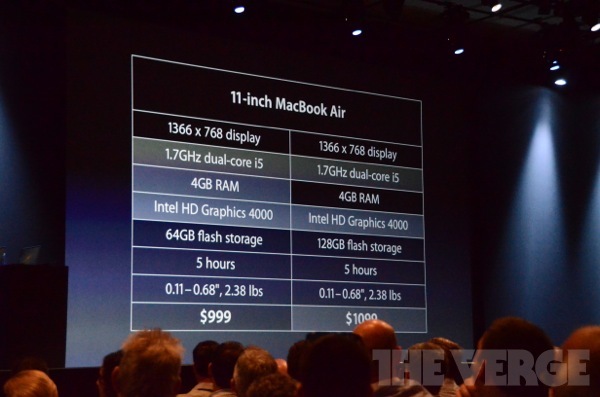 Prices are $999 and $1099 for 11 inch, which is cheaper than before, and all models are available for shipping today.